Denny Jump (Bellevue, WA, United States) on 21 August 2018 in Lifestyle & Culture. Among the many beautiful and touching monuments and statues around the Washington State Capital in Olympia is this Monument: "Winged Victory". This statue, erected on 30 May 1938, is dedicated to World War 1 Veterans. 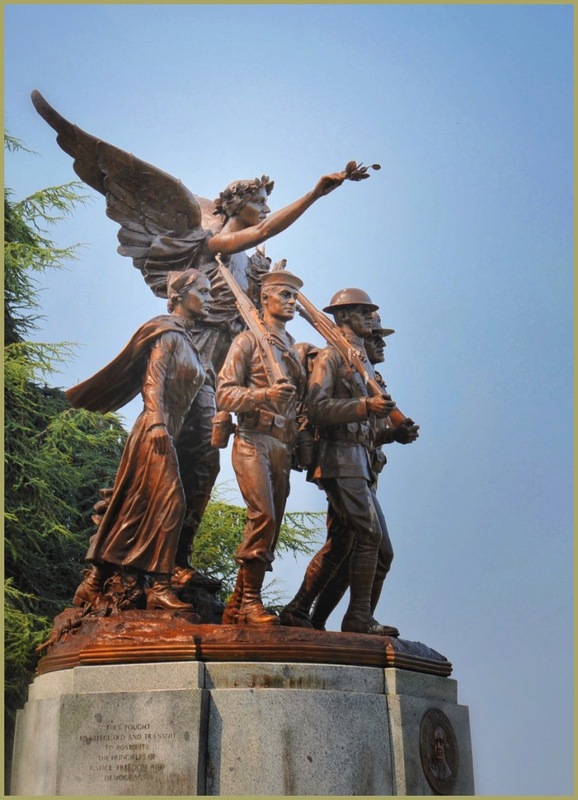 It includes bronze sculpture with a 12 foot-tall Winged figure and other figures of a soldier, sailor, Marine, and Red Cross Nurse. This wonderful monument immediately caught my eye before we even got out of the car....Amazing and gripping...I hope you like this. Indeed, a fine tribute to those not to be forgotten. @Ronnie 2¢: Thank youso much, Ronnie! One of the more powerful and artistically poignant memorials I have seen. I hope you have been well, good sir, and I will catch up here over the next few weeks. It's a beautiful monument that I've enjoyed for many years. Beautifully captured, Denny. @Steve Rice: Thank you so much, Steve! Your series on the Capital in Olympia really caught my attention...and when our son,David, and his wife and daughters arrived from Vallejo, David said - "I want to go to Olympia and visit the capital" (David is a smart guy ;-) ! !......Incidentally, I had to do a lot of processing on the images from that day (at least the outdoor ones) because it was Wednesday of last week and there was nothing in the sky but a BRIGHT GLARE!!!...eegads.... Thank Goodness for software editing tools ;-) Thank you so much for your encouraging posts...they were awesome!! Superb, nothing more beautiful than a winged victory statue, my fave ! @Existence Artistique: Thank you so very much, my friend. Your work is so enlightening and inspiring!! Great capture of this beautiful statue!! A fabulous image Denny! Such a beautiful sculpture. Interesting monument and beautifully photographed. I love the illumination coming from the warm light.